If you do know, maybe you’re like me and you’ve seen in impact or natural holistic health modalities which embrace the idea of natural medicine as an alternative to patented designer prescription medications. As a matter of fact, I’ve witnessed natural cures (I realize I’m not qualified to use the word, “cure,”) using simple techniques and herbal medicine that have far-surpassed whatever promises the medical community might make. I’ve known many people who were given six months to live. For those who simply accepted their dire diagnosis, they passed away within a year. For the others who sought to fight the doctor’s death sentence, with alternative medicine and natural remedies, guess what? You guessed it, and something deep inside you knows it’s true. They are all living their lives fully and joyously. The miracle of the human body to heal itself while accelerating natural healing with what mother nature has provided for us. Our planet and its inhabitants are perfectly matched and attuned to work in concert for our highest and best outcome. Everything you could possibly need was placed here on earth before we were put here. We experience life in the most comprehensive closed system, which is in itself is one of the most amazing miracles, confounding the highest thinkers of time since our introduction to this planet. Nothing is more natural than having the ability to heal yourself; this is what your body was designed for. If this is true (and you know it is), then why is it illegal to honestly tell your story? There are people who have boldly proclaimed the power of natural healing and natural cures. Where are they now? The answer is so impossible to imagine that I won’t even attempt to offer any suggestions. Suffice it to say, in general, they do not continue their professing natural cures for very long until their voice slowly fades into the confusion of obscurity. I have long been a supporter of natural healing, studied and practiced in various areas of alternative health care, though this is not the main focus of my personal calling. I was first so impressed early in my ministerial career, at how effective prayer was in initiating spontaneous healing, this sparked my interest in natural healing. And believe me, if you’re seeking out natural remedies or an active participation in holistic health, consider spirituality as part of the comprehensive therapeutic approach. A little belief goes a long way. The integration and calling upon a higher power can make all the difference. If we can agree that all disease affects three separate but unified parts of us, our body, our mind and our soul, then neglecting the soul can hinder your healing and wellness significantly. Can natural healing be accomplished without spiritual integration? Absolutely, but the results are far greater and more rapid with your heart connected to the source of all life. If you think you’re ready to take responsibility for your own health, the good news is, Google is a good repository for the otherwise hidden jewels for natural remedies. You can pretty much find anything you could possibly think of, though much of the information is anecdotal, and you will find a lot of people swearing that considering any of these natural cures is dangerous, if not lethal. Be smart about it. Exercise your due diligence and see what dies. If you’ve been given six months to live, it may not be you, it might be your belief in what you’ve been trained to believe about health and medicine. For many people chronic or persistent pain can be debilitating. It can render you incapable of experiencing the good life that abounds all around you. Doctors can medicate you in such a way so as to keep you in a mild state of pain, which further limits your ability to find joy in life, but as soon as the drug wears off, you rush to the pain medication again for some relief. 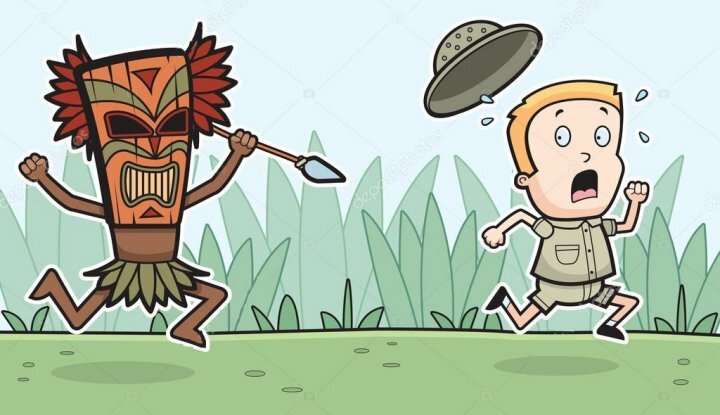 The thing with drug interventions for pain, especially long lasting pain associated with some physiological trigger, is that it can develop an addiction or dependence on an unnatural substance which leads to liver failure and a declining overall health of your biology. In other words, the pain medication, while it does offer relief, is making you susceptible to contracting other disease, bodily malfunction and deterioration, and quite frankly is slowly killing you. Throughout my life, I have had the opportunity to respond to people who have suffered from persistent and chronic pain and offered some impressive relief. Successful methods of eliminating pain which were not associated with drugs or other medical intervention included prayer, meditation, positive thinking, hypnosis, life change (living a better life), and Reiki. All of these are sound eliminators of pain which had been suffered as a constant or persistent state for long term victims of pain. Prior to these interventions, chronic pain victims could only mask their symptoms by maintaining a medicated zombie-like state. Though this is not much quality of life, it is far better than living in constant pain. Yet, these same people were able to start new lives free of pain and were able to reverse the process of deterioration resulting from the pain and its medical management. Why is it that these alternate methods of eliminating pain (instead of managing it with drugs, which have known side effects, including but not limited to resulting in death) are not taught in the colleges and universities responsible for training our health care professionals? While our medical professionals are trained on the body’s neurology and biology, the only treatments offered as solutions include surgery and drug therapy. While these can be necessary and prudent in urgent interventions, are they all there is? Where are the classes being taught about other known and proven therapeutic models, such as prayer, meditation, positive thinking, hypnosis, life change (living a better life), and Reiki? (a short list of all the possible healing modalities that can be found all around us, yet ignored, if not shunned, by the medical community). While my life’s work has been more focused on the human ability to change one’s life in a powerful, transformational metamorphosis, the modalities and therapeutic sciences I have trained in and use as tools to effectuate massive changes in neurology often are effective and also used to allow sufferers of chronic pain to let go of the pain, and live highly productive lives without pain and in unexpected states of fulfillment, happiness and joy. Eliminate pain without the threat of deterioration or death? I don’t know about you, but to me, this is a much better potential outcome to therapeutic intervention than deterioration and death by patented medication. I am tempted to develop a support system for alternative therapeutic models that maintain a drug-free alternative to traditional medical practices. I call many of these practitioners friends, and I so appreciate their answering the call to follow these practices and helping so many people find a better life, without pain allowing them to find fulfillment, happiness and joy. If you’re practicing an alternative healing modality, contact me. I think I can help you better answer your call and help to make the world a better place. Blessings to all the natural, alternative healers. Interestingly enough, some of them experience miraculous recoveries. Not all of the patients are faced with having to sort through the details of their recovery in an effort to discover why they aren’t dead, because most of them did die. Those who lived are grateful to have another day and continue to do so for the remainder of their long life. No one believes in miracles more than me, but if you have access to the people who lived and ask the right questions, another vista begins to appear on the horizon. Based on my (admittedly anecdotal) research of those who have lived and others who have died, I have concluded that a common perspective is shared by those who live and alternatively those who die. And that is that they began to live. They began to live their life like never before. They began to live their life like they only had six months to live, then five, then four, then three, then two, then one, then each day – one day at a time – living each day as if it was their last, in an effort to fit as much life into that one day as possible, then onto the next. Alternatively some of those who defied death took full responsibility and alternative proactive approaches to their medical condition, which may have included a complete change of lifestyle and an out-of-country medical vacation. Medical tourism is growing by leaps and bounds as Baby Boomers go offshore for alternative treatment modalities that are highly effective but not legal in the United States. Other alternative therapies are also considered to affect change and to enhance one’s ability to enjoy a higher quality of life in their remaining days or years. So, the “miracle” in the doctor’s miracle-or-misdiagnosis proposal appears much less than a miracle than it may seem. In fact, the doctor’s referring to what has actually transpired seems to be not the declaration of a miracle at all but more of a dismissal of anything the patient may have done to affect such a miraculous metamorphosis. What would you do if you were given six months to live? Having an idea about how you might respond may have you prepared and at peace with your reaction if you are ever the recipient of such a grim diagnosis. Or, you might consider living a better life, your best life and making the world a better place now and possibly even bypass the entire scenario altogether. You don’t need a death sentence to start living. You can start living your best life today. I have the privilege to work with people who are both patients and practitioners of alternative treatment therapies. It never ceases to amaze me that people can heal themselves of all types of ailment, from sleeplessness to cancer without drugs or surgery. People with ailments are looking for alternative methods to deal with the emotional and physical issues that rear their ugly head when you least expect it. The health management industry is bilking the unsuspecting public while promoting continued dependence on the system for health management. For instance, if you have pain in a particular area of the body, you can go the doctor and get a prescription medication to reduce or eliminate the pain. 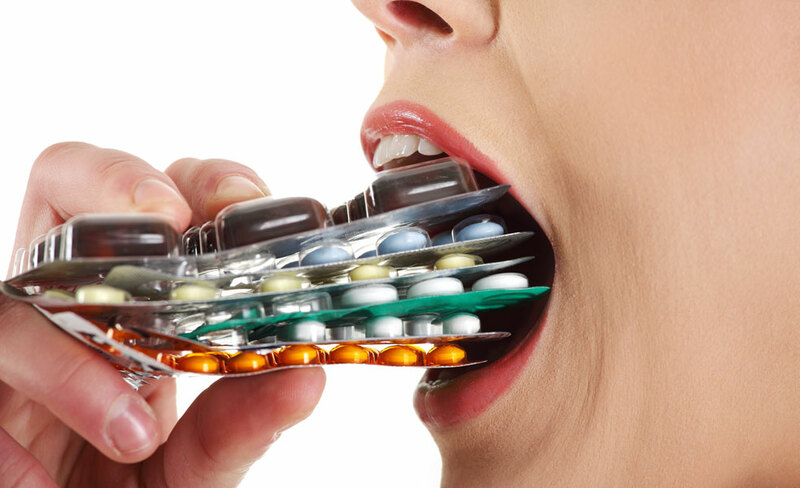 The prescription medication is scientifically designed to target the specific ailment, but also possesses a host of side-effects. No problem, as the doctor has prescription medications to treat the ailment(s) arising from the use of the original prescription, each with its own set of side effects with prescription solutions for these new ailments also. Is it just me? Or does anyone else see a problem with this form of health management system? It occurred to me long ago, when making deathbed visits to people in the last moments of their lives, the mass of little brown bottles on the nightstand made me think something might be wrong with the system. I’m not saying it is entirely broken, as many lives are saved and life enhanced by medical intervention, treatments and surgeries. But there appears to be a dark side to medicine is disconcerting, to say the least. Your body will heal itself if you love it with everything you’ve got. 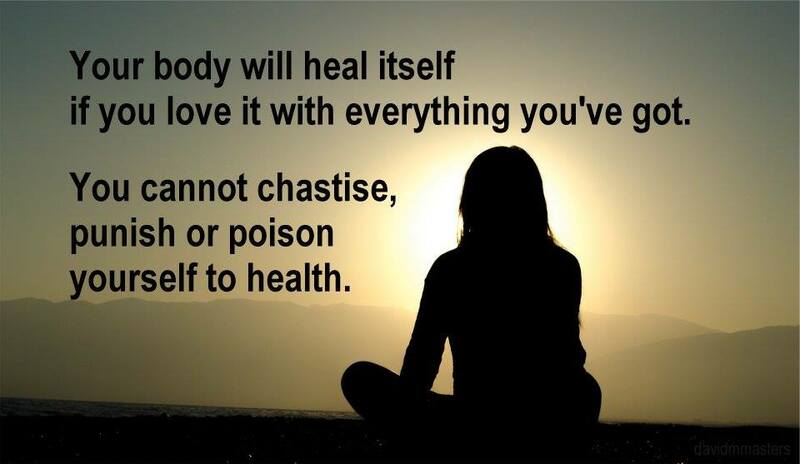 You cannot chastise, punish, or poison yourself to health. People are waking up to the reality that something is amiss and they are seeking alternatives. There are thousands of non-medical treatment alternatives for just about anything that ails you, all within a few keystrokes of Google. I actually know people – real, live people – who have healed themselves from chronic diagnosis indicating a short-term death sentence (given six months to live). Rather than take the prescribed treatment approach to dealing with their life-threatening circumstance, they reach out and embrace alternative treatment modalities varying across the board. Most of them proceed in secrecy, so as to avoid the negative feedback from others who disagree with their decision to seek out alternative treatment models. In fact, they report that maintaining a positive environment is a critical component to their treatment alternative. I embrace personal health care and take responsibility for my own wellness without using prescription medications and feel as though my efforts are very effective, though it takes continual research and experimentation because what works for one person might not work for someone else. Fortunately, there are health care professionals who also embrace these alternative treatment modalities. In this way, I can focus on my own self help therapy with holistic support and reaching out to a naturopath in search of an intervention offered by homeopathy as an alternative to seeking a traditional doctor who is likely to rely solely on prescription medications. 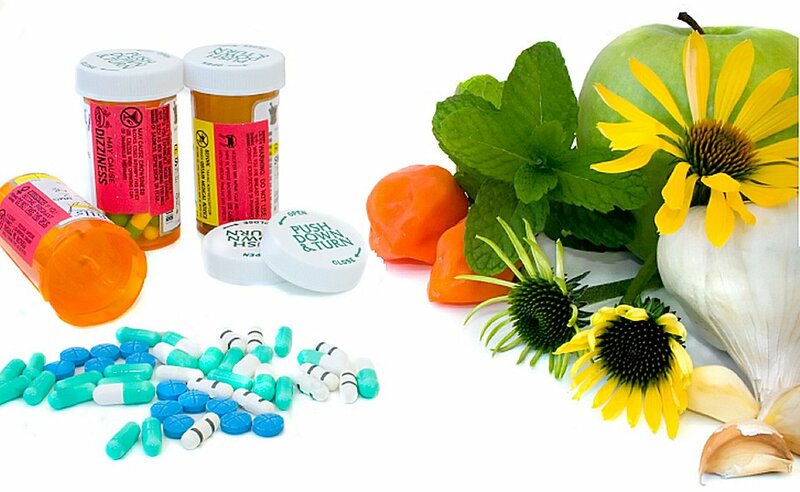 A naturopathic doctor will offer holistic medicine alternatives, like homeopathic remedies which are natural remedies and other alternatives, and a holistic doctor will refer you to a medical doctor, if necessary, to augment a complete integrative medicine approach. I honor professionals and their work on both ends of the healthcare treatment spectrum. 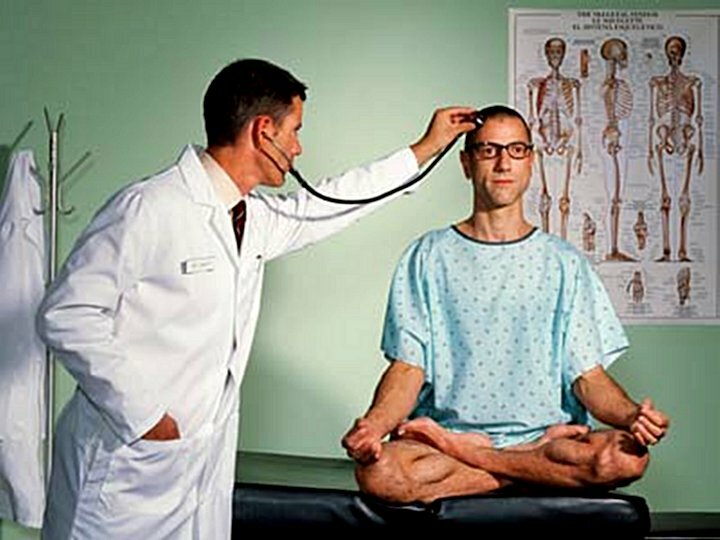 What is your favorite alternative health treatment?